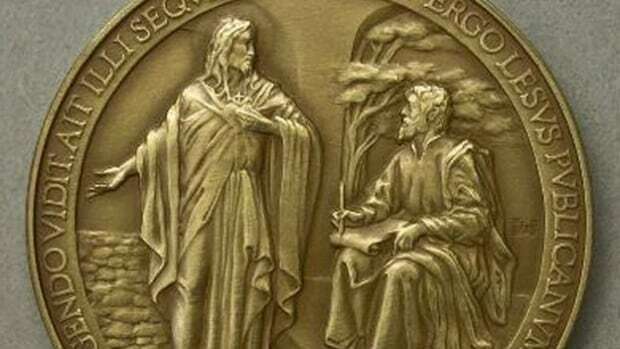 The Vatican has withdrawn thousands of gold, silver and bronze medals minted to commemorate the first year of the pontificate of Pope Francis after discovering it had misspelled Jesus. The medals, produced in gold, silver and bronze by the Italian State Mint, went on sale in official Vatican stores on Tuesday, but were withdrawn two days later after the error was noticed, the Vatican Publishing House said. The inscription is Francis’s papal motto, taken from a meditation by the eighth-century English monk the Venerable Bede, from a passage of the Gospel in which Jesus calls St. Matthew to be an apostle. Before they were withdrawn, four people purchased medals displaying the error, which could fetch high prices on rare coin markets, Italian media reported.